We believe in a publicly provided, publicly funded and democratically determined health service. We believe that the profit motive should have no place in the heart of our health care. We wish to see health care provided by NHS organisations and not private providers on a profit basis. Unfortunately, the government’s legislation of 2012 makes this more difficult to achieve. We are concerned that private providers in the health system may threaten the provision of high quality health care for patients and undermine the working conditions and salaries of hard pressed staff by cutting costs to win contracts and make profits. 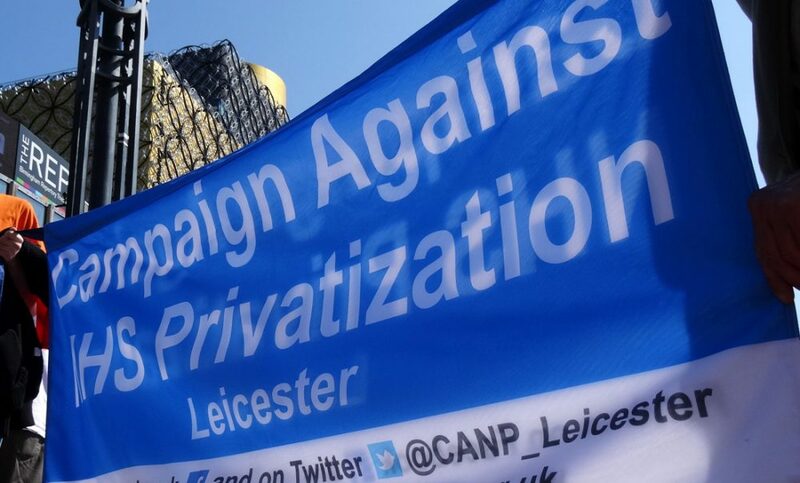 However, we believe that the people of Leicester and Leicestershire have the right to expect that the strengths, ethos and values on which the NHS was founded be protected and continued. We expect the CCG to commission services in a way which does not reduce the continuity of care experienced by patients. We expect the CCG to make commissioning decisions which are in the best interests of patients and wider local communities and to resist the imposition of ‘any qualified provider’ by others. The CCG and Health & Wellbeing Board* must conduct their business in an open and transparent manner, must pledge to resist being bound by considerations of commercial confidentiality and must undertake not to allow any organisation in receipt of CCG funds to conceal how they are spent on the grounds of commercial confidentiality. What’s a Clinical Commissioning Group? *CCGs are the new organisations responsible for deciding locally what health services patients will be entitled to have. They hold the majority of the NHS budget and are composed of groups of GP practices. We have one CCG in Leicester City and there are two others in West Leicestershire & East Leicestershire & Rutland..
*What is the Health and Wellbeing Board? This is a new committee in the local authority responsible for ensuring health and social care services are provided in a joined-up way and for ensuring a role for democracy in the health service. ps West Leicesterhire covers 3 district council areas, North West Leicestershire, Charnwood, and Hinckley & Bosworth. East Leicestershire and Rutland covers district councils of Blaby, Harborough, Lutterworth, Melton Mowbray, Oadby and Wigston and the county of Rutland.